It's no small feat to be one of Japan's most acclaimed and versatile architects. But that's Kengo Kuma for you – in hot global demand and constantly working. His mantra has always been to "recover the tradition of Japanese buildings and to reinterpret these traditions for the 21st century." In Tokyo, construction has recently begun on his design for the new National Stadium for the 2020 Olympics and he's building a 13-storey luxury hotel in Ginza, not far from where he built the Tiffany & Co boutique. His rate of work in Japan is matched by numerous projects around the globe: a new Japanese restaurant, Ta-ke, in Hong Kong; mixed-use skyscrapers in Vancouver; a hotel in Paris; a maritime museum in Brittany, France; and a Hans Christian Andersen museum in Odense, Denmark. And of course, he's also worked extensively in China. 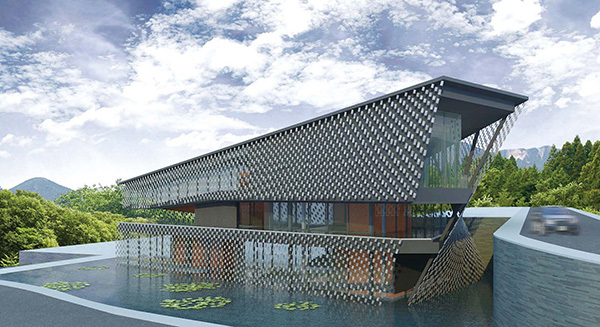 Located at the foot of Chengdu's Laojunshan in the southwestern Chinese province of Sichuan, the Zhi Art Museum is classic Kuma. Modernist austerity blends with an undulating landscape of mountains and rivers, reminiscent of classical Chinese paintings. The stunning structure uses brick tiles, a traditional local material, which hang and float tantalisingly in the air. Indeed, the museum has the feel of taking a stroll through a garden, with direct sunlight blocked by the tiles and the light opening up in slats. The upper floor affords a paramount view of Laojunshan itself. Such serene architecture brings to life the beauty and tranquillity of zen – or in this case, Taoism – and the museum bears the hallmarks of Kuma's signature design ethos, with the Eastern philosophy of learning from nature, all the while combining technological advancements with an innovative use of materials. In this case, the main components are light and water – the latter in the form of a large pond, which extends to the exploration of the natural materials throughout, as the architecture organically harmonises with its surrounding elements. The tranquil flow and soft movements surrounding the entirety of the structure allow for contemplation and evoke the notions of eternity through its unity with nature. Kuma constructed it all in line with the core concept, which is based on three principles: universality, insight and innovation. Kuma's Zhi Art Museum is enhanced by an exhibition launch in the space. Curated by Zhang Ga and on show until August 12, Open brings a highly idiosyncratic body of work by nine artists. Particularly notable is the monumental installation Pneuma Fountain in front of the museum; Chico MacMurtrie and Amorphic Robot Works' latest inflatable robotic sculpture interprets the overarching theme of "open" as a contemplative experience of movement, air, light and architecture. The main gallery houses Zhang Peili's enigmatic A Standard, Uplifting and Distinctive Circle Along with its Sound System. Participation in this Duchampian installation is delegated to an automata operated via software manipulation. Get ready to be awed, but don't forget that a visit to Kuma's elegant Zhi Art Museum is an artwork on its own.